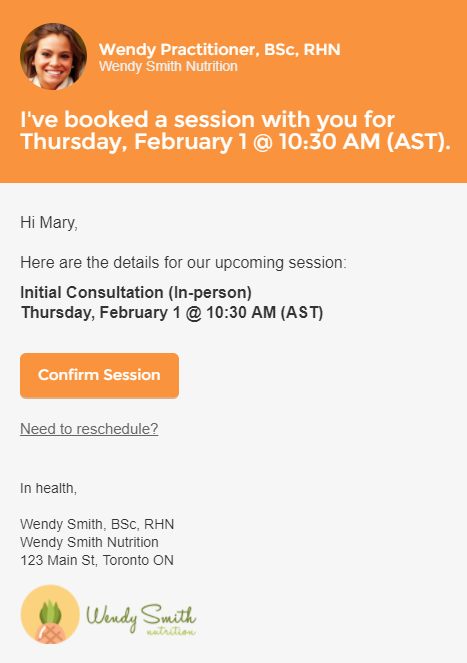 You can customize notification emails sent to clients in our Pro and Plus Plans. Templates allow you to change the subject, title and certain parts of the email body. Head over to Settings > Notification Preferences > Client Notifications to view a list of customizable templates. Uncheck the checkbox to use the default email template for the notification. Certain templates may also provide more specific placeholder options, e.g. the Amount Due and Invoice Number for invoice receipts and the service type and session date for appointment reminders. You can also include your logo if you've set one up on your main Logo & Branding page. For users on our Plus Plan, your brand color is used as the background for every email sent to your clients. Links to Practice Better from these emails will redirect clients to your Personalized URL with your logo and branding customizations.